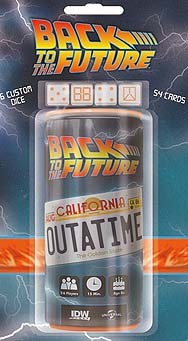 Back to the Future: OUTATIME is a fast-paced dice game for up to six time travellers. This push-your-luck dice games is fifteen minutes of fast fun that pits players against each other in a race to hop in their DeLorean and power up the flux capacitor to 1.21 gigawatts. Slow and steady won't win this race when th rolls you make can also be used by your opponents, so put the pedal to the metal and gun the fun up to 88 miles per hour!